Like most smartphones offered by AT&T, the Motorola Atrix HD offers a rather modest retail package. In the carrier branded box, you will find a charger and a microUSB cable to go with the usual set of booklets. The headset prayers were once again left unanswered and there's no microSD card to be found, either. This time however the retail box and its contents are at least reflected in the device's price tag, so we won't be deducing as many points as usual. The Motorola Atrix HD looks much like a Motorola RAZR that has its buttons below replaced with virtual ones. In fact, if it wasn't for the slightly rounder edges, the AT&T smartphone would easily be mistaken for a member of the RAZR family. Our main grudge here is with the placement of the AT&T logo. It looks out of place below the screen and can be mistaken for a capacitive button. The build quality of the smartphone is phenomenal. 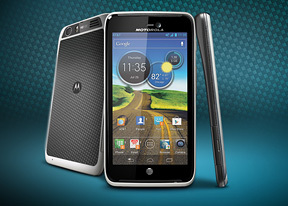 The Motorola Atrix HD is a blend of Kevlar and Corning Gorilla Glass. The amount of plastic used in the construction is small and even that seems to be of really high quality. The dimensions of the smartphone are 133.5 x 69.9 x 8.4 mm, while its weight tips the scale at 140 grams. The Motorola Atrix HD is hardly one of the lightest devices you will encounter, but you couldn't realistically expect a with a 4.55" screen to be much more compact. The display of the smartphone is one of its strongest features. The 4.55" LCD unit of 720p resolution uses an RGB matrix and Motorola's ColorBoost technology. These numbers add up to a pixel density of 326 ppi, which as good as it gets really. The screen is also seriously bright and offers good sunlight legibility. The RAZR family and its PenTile AMOLEDs were certainly good, but we certainly prefer the screen Motorola went with this time. Above the display you will find the earpiece, the usual set of sensors, as well as the 1.3MP front-facing camera. Below the screen is where the mouthpiece and AT&T logo reside. We already told you how we feel about the latter. The microSD and microSIM card slots are hidden under a cover on the left side of the device. On the right, you have the power/lock key and the volume rocker. The top of the Atrix HD is home of the microUSB and microHDMI slots, as well as the 3.5mm audio jack. There is absolutely nothing on the bottom of the device. The Kevlar covered back of the device is where the 8MP main camera and its LED flash can be found. They are located on the very RAZR-like chin on the top of the Atrix HD's back. The loudspeaker grille is located right next to them. There is a secondary mic on the bottom part of the handset's back. The 1780mAh battery is non-removable. 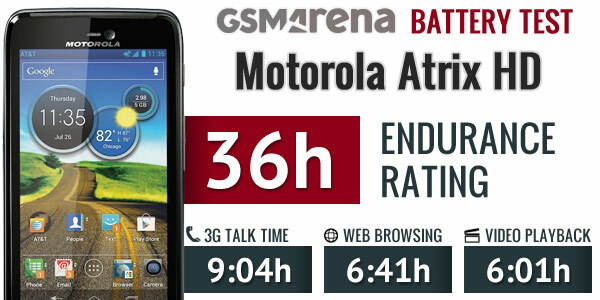 It powered the Motorola Atrix HD to the uninspiring endurance rating of 36 hours in our traditional battery test. This means that you will need to charge your device every 36 if you use it for an hour each of telephony, web-browsing and video playback every day. Find more on our testing procedures here. The Motorola Atrix HD handles easily for its size. The Kevlar coated back of the device has a soft-touch feeling to it. It is also quite grippy, so unwanted accidents are not likely. The Motorola Atrix HD deserves high marks for its craftsmanship. It feels a lot more upmarket than its price tag suggests. Design could have been more inspiring, but it is a matter of personal preference. Besides, that gorgeous screen is surely going to keep your attention from the looks of the phone. As for the retail package of the handset - it is hardly a surprise. Following next is a look at the software of the Motorola Atrix HD, as well as its performance.